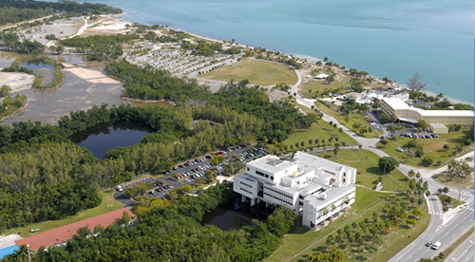 AOML is a member of a unique community of marine research and educational institutions located on Virginia Key in Miami, Florida. Our neighboring institutions include NOAA's Southeast Fisheries Science Center, the University of Miami's Rosenstiel School of Marine and Atmospheric Science, the Maritime and Science Technology (MAST) Academy, the Virginia Key Beach Park, and the Miami Seaquarium. The Rickenbacker Causeway provides access to the islands of Virginia Key and Key Biscayne via Sun Pass, a Florida Department of Transportation prepaid toll program. Our operating hours are Monday through Friday, 8:00 a.m. to 4:30 p.m.
Miami International Airport (MIA) and Ft. Lauderdale International Airport (FLL) are withing driving distance of our facility.